Pancreatitis in cats can be a very serious disease. Any time a cat won’t eat for more than a day, it’s significant. And if your belly hurts and your feel constantly nauseous, you’re probably not going to eat. Pancreatitis is a painful condition that if left untreated, can have devastating results. Tommy’s story: Was it just hairballs? Tommy has been Andy’s deeply bonded companion for the past 12 years. If Andy was home, Tommy was with him, sitting on him if possible. 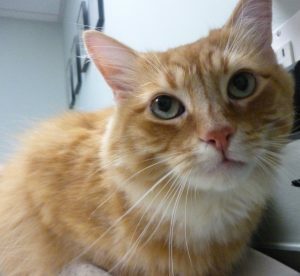 Tommy has received routine care with A Cat Clinic since he was a kitten, with no major medical problems. When Tommy threw up a hairball (at 4 AM), Andy didn’t think too much about it. But, 2 days later when Tommy wasn’t eating and became lethargic, Andy knew he had to bring Tommy in. Dr. Rubenstein had appointments, so Dr. Mustillo swung into action. After initial blood tests, x-rays and a screening ultrasound exam, Dr. Mustillo started Tommy promptly in intravenous fluids, medication for his painful abdomen and general supportive care. But Tommy had a purr that only critically sick cats will make, and we were all extremely worried. Purring does not always mean your cat is happy, unfortunately. Initial blood tests showed extreme dehydration, acute kidney failure and elevated bilirubin (“jaundice” in people) which can indicate liver, intestinal or pancreatic disease. And frequently cats can have a problem with all three at once. Tommy’s x-rays and in-hospital ultrasound exam showed a fairly normal liver, but the intestines and pancreas both showed marked abnormalities. Which was primary and which secondary? Regardless, we weren’t exactly sure of a diagnosis and clearly Tommy wasn’t going home that night. Initially, dehydration was the most critical problem and IV fluids the top priority. We don’t like leaving sick cats unattended, so we convinced Andy to take Tommy to the Hope Center in Rockville for overnight care. Tommy continued on IV fluids overnight with Dr. Zaritsky and Dr. Randolph. It is unfortunately easy to over-do IV fluids causing fluid in the lungs, so it’s a balance of giving the amount needed without exceeding what the cat can handle. Fortunately, both Dr. Mustillo and the emergency team knew that “slow and steady” was key, and Andy did well. The next morning, the kidney values returned to normal but the bilirubin was still high. Abdominal ultrasound exam by board-certified radiologist Dr. Paek at Hope Center confirmed that pancreatitis was the primary problem in Tommy, and it was one of the worst cases we have seen. Pancreatitis means inflammation of the pancreas – which doesn’t give us a specific thing to treat (like a bacterial urinary infection can be treated with antibiotics). With pancreatitis, it is a matter of giving “supportive care” until the pancreas heals on its own. And unfortunately, some cats remain so nauseated that they will not eat, requiring a temporary feeding tube. This allows the cat to be home and receive nutrition and medications until he starts eating on his own. Fortunately for Tommy, he started eating before a feeding tube became necessary. Tommy isn’t back to normal yet, but he’s definitely improving. He’s at home and doing much better. Andy is grateful to Dr. Mustillo for rescuing Tommy, who likely would have died that day without her jumping into action. If your cat stops eating, is vomiting, or seems to have a painful abdomen, a veterinary exam is definitely necessary. The longer a cat is sick with pancreatitis before initiating treatment, the less the chance that the story will have a happy ending like this one.